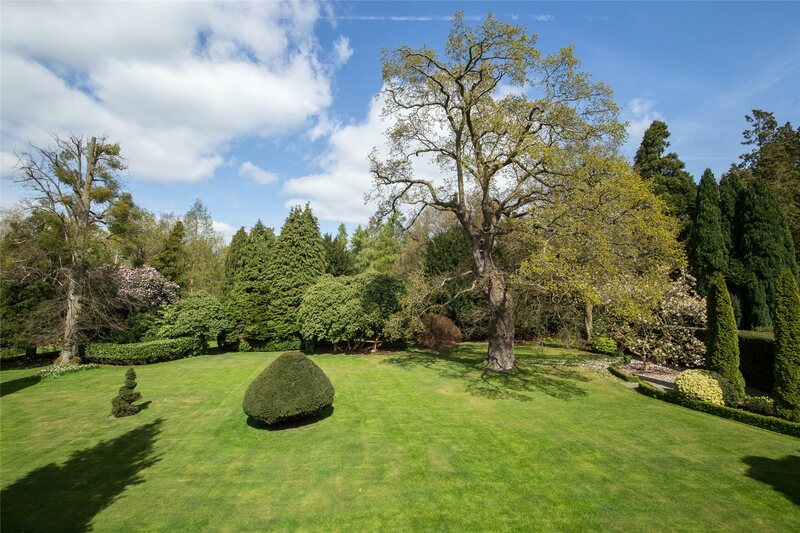 Set within glorious gardens, Bishopsgate Hall is an exceptional attached property offering generously proportioned rooms with a wealth of original and interesting features. 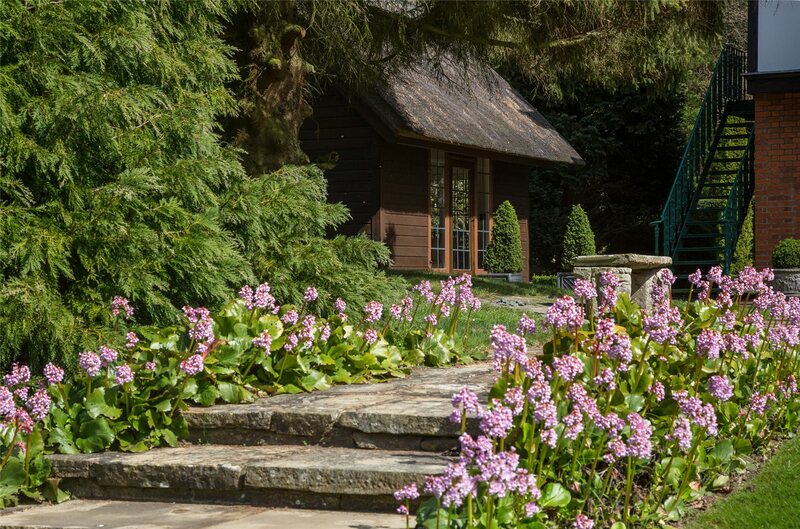 Dating back to approximately 1820, and possibly earlier, the house has been beautifully and sympathetically renovated with extreme care and attention to detail. 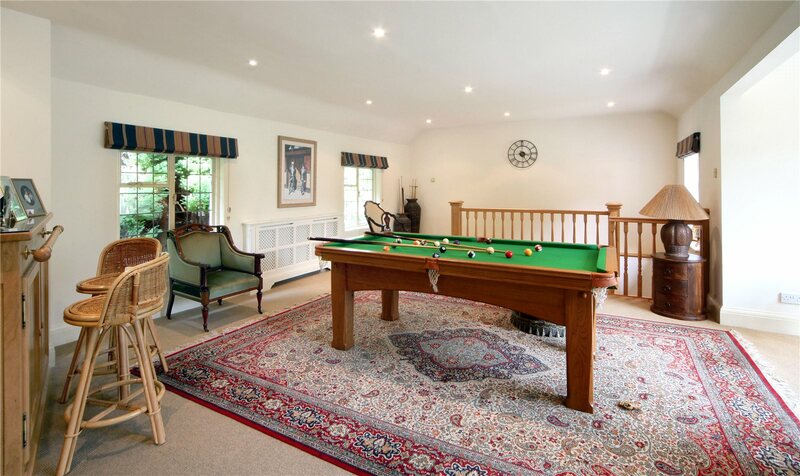 This appealing and fascinating property successfully blends period features with the luxuries of modern day living, the result of which is a truly sensational family home. The well appointed accommodation offers flexibility and is equally suited to both family living and formal entertaining. The house is entered via a spacious reception hall that creates a welcoming first impression and hints at the delights to come. Mellow wood panelling to the walls and parquet flooring combine to enhance the sense of warmth and a marble fireplace acts as a focal point. 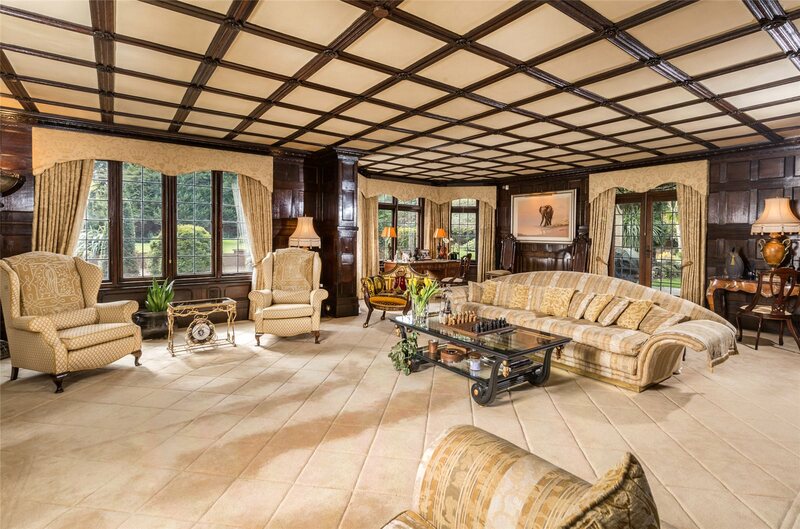 Situated off the reception hall and a definite wow factor, is the stunning drawing room featuring oak wall panelling with elaborately carved detailing above a stone fireplace, an intricately carved frieze above the door to the reception hall and carved Tudor roses to the ceiling panelling. This wonderful room has a grand, yet cosy atmosphere. It is worth noting that beneath the carpeting lies the original parquet flooring which could easily be reinstated if wished. 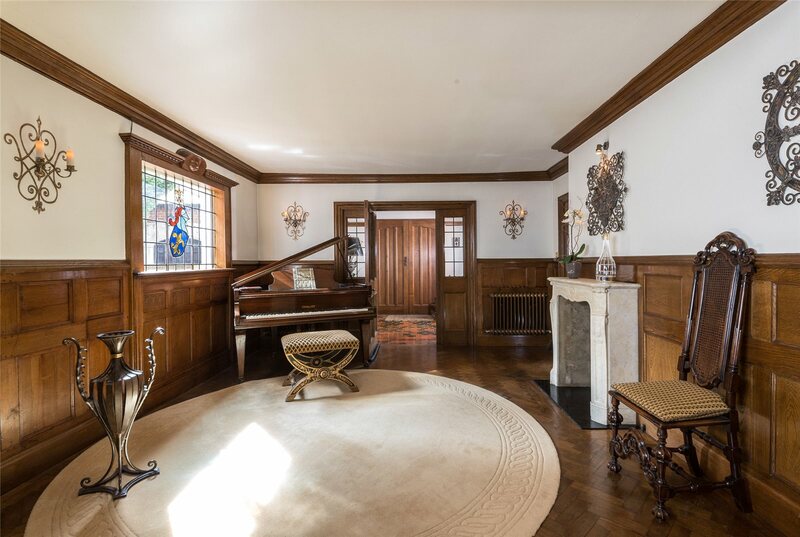 The adjoining dining room features an exposed brick fireplace and wood flooring that extends through to the connecting sitting room, where double doors open the room out to the gardens. 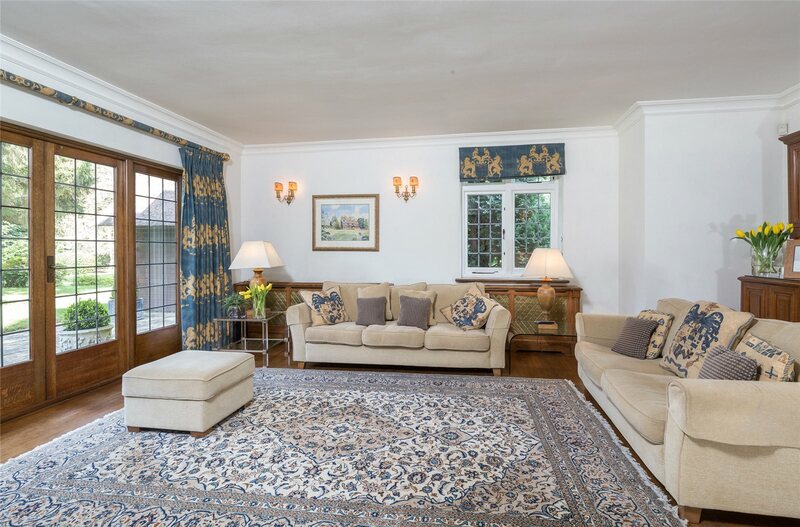 The reception rooms, combined with the adjacent kitchen/breakfast room, provide excellent entertaining and relaxation space. 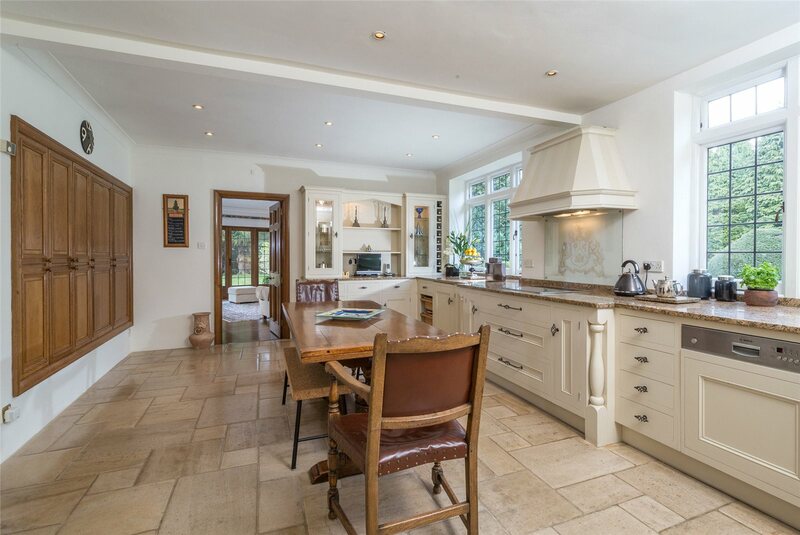 The light and airy kitchen/breakfast room enjoys a wonderful outlook over the landscaped gardens and is ideal for less formal dining, with plenty of space for a dining table and chairs. The kitchen is fitted with a comprehensive and bespoke range of units with granite work surfaces and integral appliances; the attractive ‘pillow edged’ limestone tiled floor continues through to the utility room. Off the reception hall is a useful lobby with a built-in coats cupboard a wine store/pantry and a cloakroom. 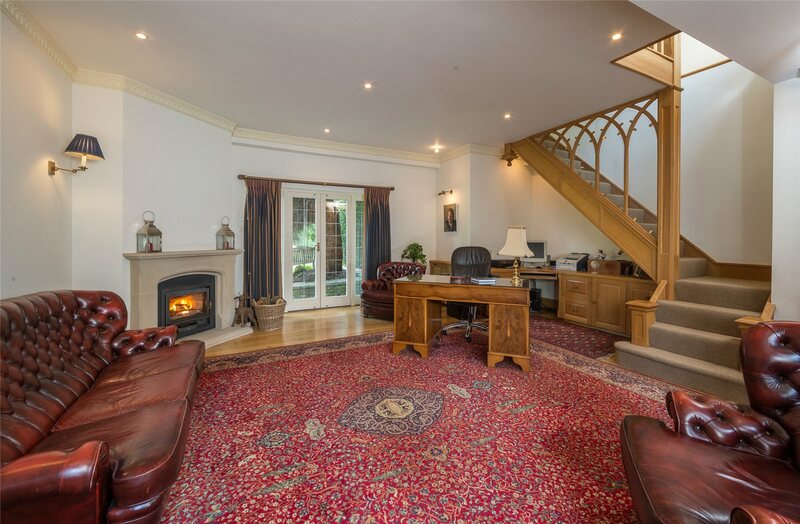 A small hallway, also located off the reception hall, provides access to a generously proportioned study fitted with a range of oak furniture, with wood flooring and a stone fireplace with an inset log burner. An oak staircase with glass balustrading and ornate arched detailing rises to a games room and store room. This wing of the house could be reconfigured to provide self-contained living space if required. 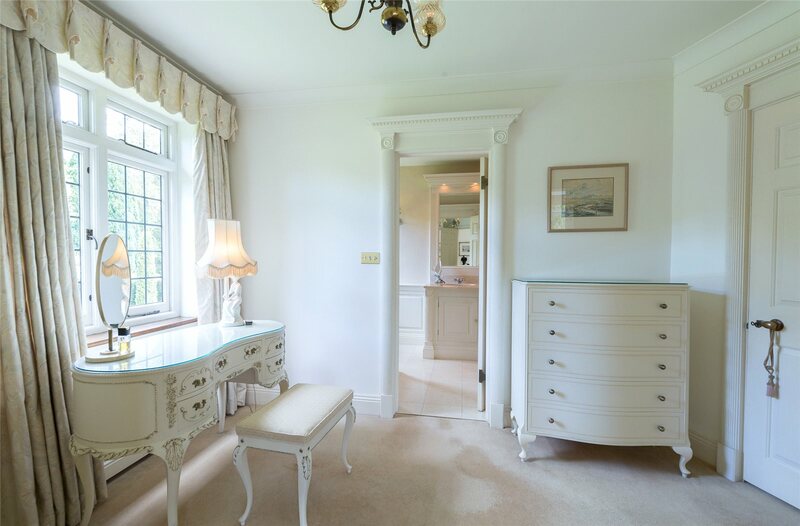 To the first floor is the master bedroom with an en suite dressing room and bathroom, a spacious guest bedroom with an en suite bathroom, two further good size bedrooms and a family bathroom. 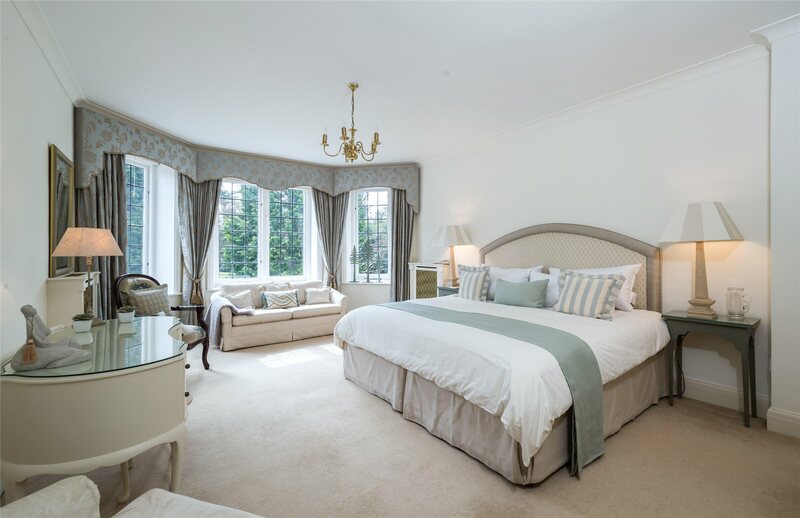 A fifth bedroom, measuring an impressive 20’6”, and an en suite bathroom occupy the second floor. N.B. The present owners have been granted a Certificate of Lawfulness of Proposed Use or Development for the erection of a leisure complex comprising a swimming pool, gymnasium, changing room, games room, garaging and plant room. 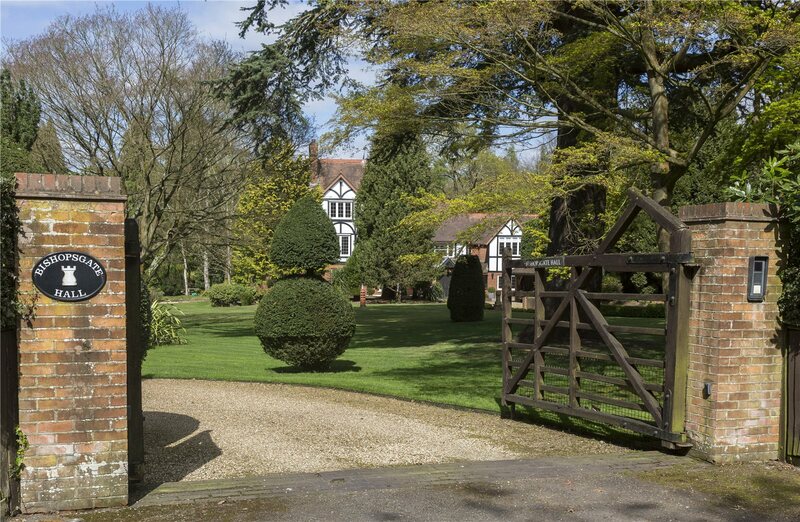 Bishopsgate Hall enjoys an exclusive position immediately adjoining, and with direct access to, the 5,000 acre Windsor Great Park offering the opportunity for many leisure pursuits such as walking, cycling, and horse riding (subject to obtaining the necessary riding permit). Savill Garden (named after its creator, Sir Eric Savill), Virginia Water Lake and the historic Runnymede are also in close proximity. 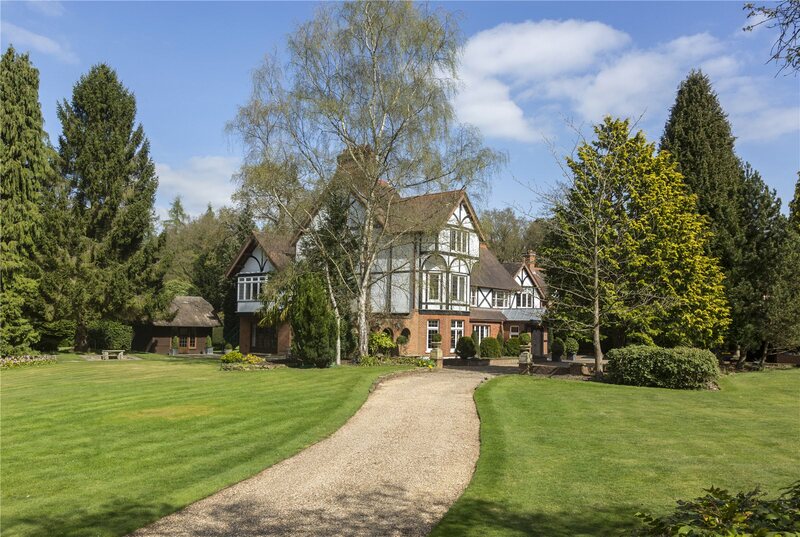 Located close to the Surrey/Berkshire border, the property is supremely well placed for access to the motorway network with the M25 (J13) 3.7 miles away, in turn linking with the M4, M3 and Heathrow Airport. Private jet services are available at Farnborough Airport and Fairoaks Airport in Chobham. Rail travel is equally convenient with services available to London Waterloo from Egham, Staines, Virginia Water and Windsor & Eton Riverside stations and to London Paddington from Windsor & Eton Station. 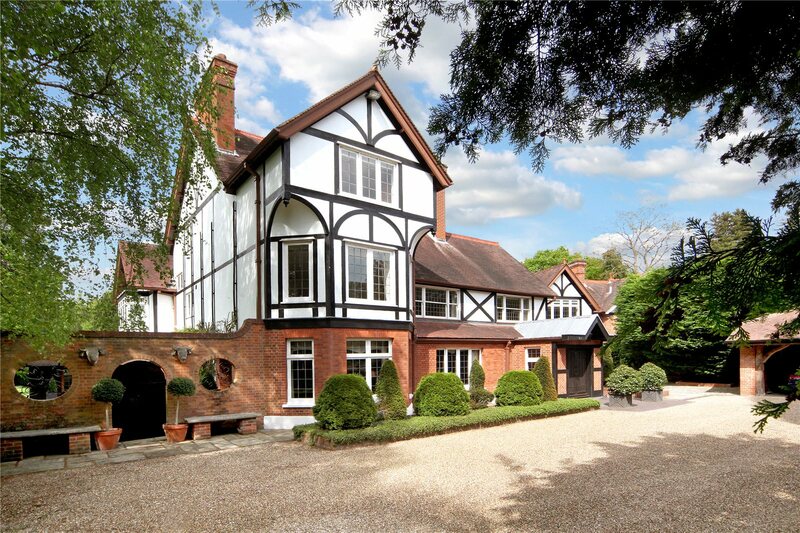 The nearby village centre of Englefield Green offers local shops catering for day-to-day needs whilst the towns of Windsor and Staines are within easy reach and provide more comprehensive amenities. The region boasts a wide variety of boutiques, bars and traditional public houses. Moreover, the area also offers fine dining at Coworth Park in Ascot, Pennyhill Park in Bagshot, The Wentworth Club in Virginia Water, in addition to Heston Blumenthal’s restaurants and The Roux’s Waterside Inn at Bray. 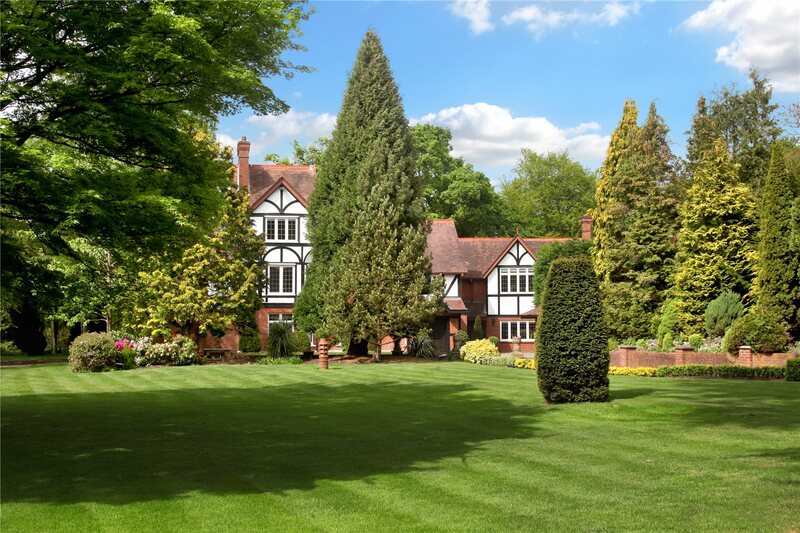 There are many outstanding schools and colleges in the area including the local St. John’s Beaumont and Bishopsgate, Brigidine and Upton House in Windsor, Papplewick, Heathfield School, St. George’s and St. Mary’s in Ascot, Royal Holloway University of London, Eton College and Wellington College. For international schooling, tasis (The American School) and acs (American Community School) are both situated in Egham. For leisure, there are prestigious golf clubs in the region including the Wentworth, Sunningdale, Swinley Forest and The Berkshire; polo is available at Guards Polo Club in Windsor Great Park, Coworth Park and The Royal County of Berkshire Polo Club. 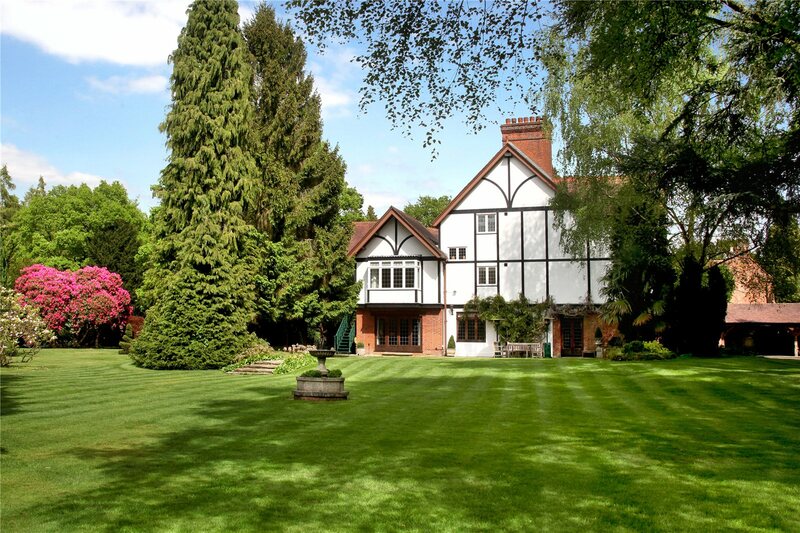 Horse racing is available at the renowned Ascot Racecourse and at Windsor, boating and rowing on the River Thames and tennis may be enjoyed at the local Coopers Hill Lawn Tennis Club. Attractions for all the family include Windsor Castle and Legoland. 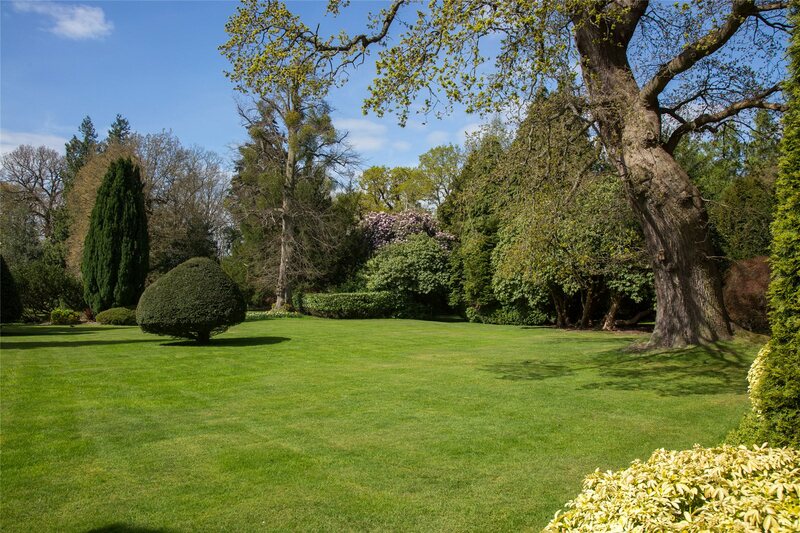 The grounds truly are a wonderful feature of the property and provide an outstanding setting for the house. 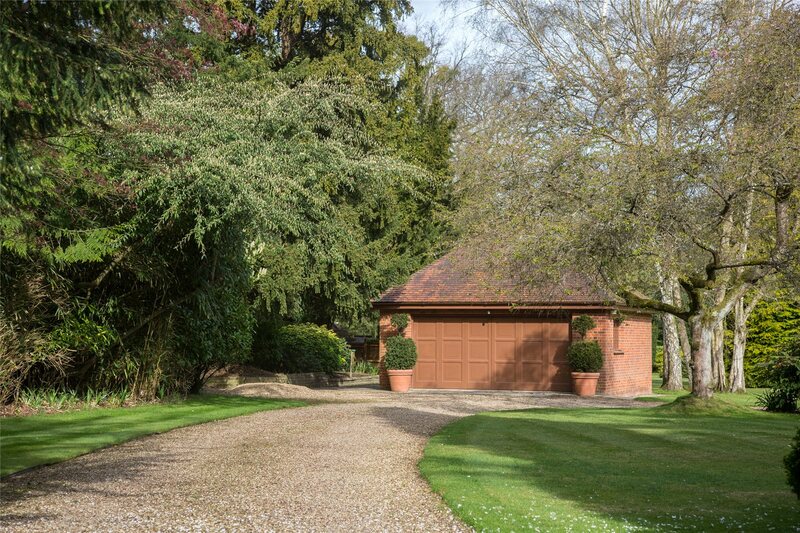 Bishopsgate Hall enjoys a secluded situation and benefits from a gravelled carriage driveway, guarded by electrically operated gates. 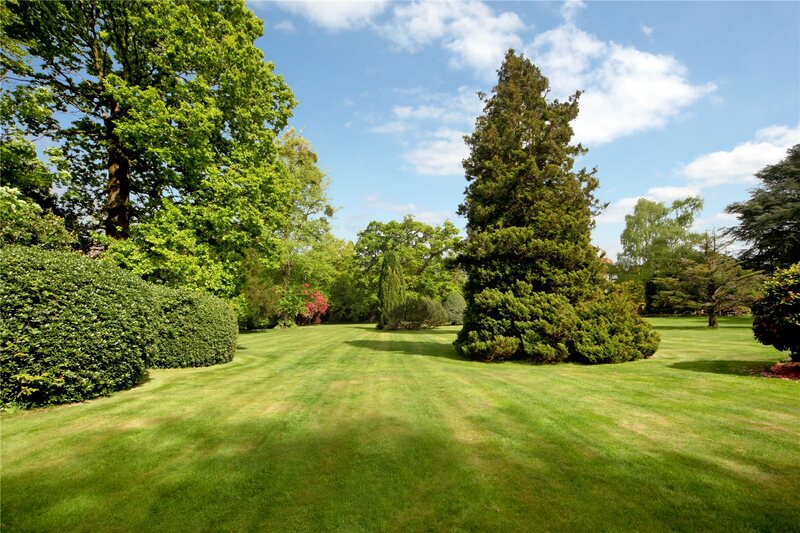 The meticulously maintained gardens extend to approximately four acres and have been thoughtfully designed and planted to provide year round interest. 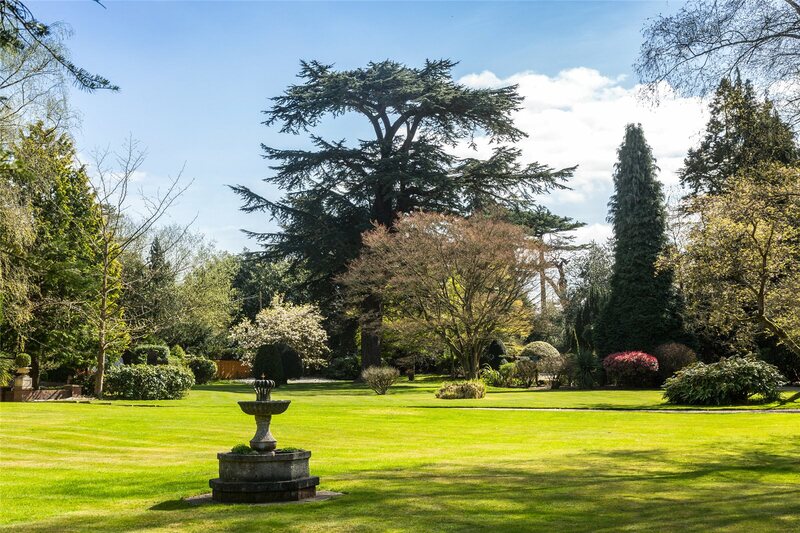 Enclosed by a variety of mature shrubs and trees, the gardens enjoy privacy and a paved terrace provides a superb relaxation area from which to enjoy the outlook. 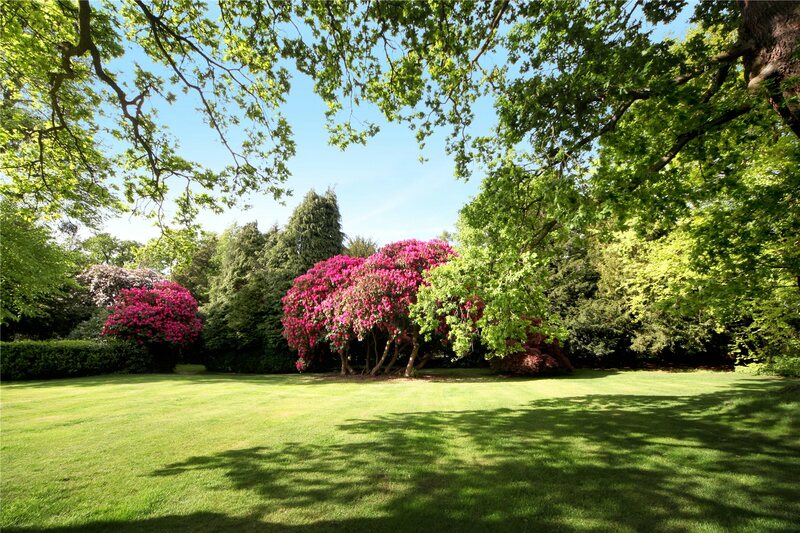 Extensive lawns rolling away from the house are interspersed with various clipped shrubs and mature trees including magnificent magnolias; banks of well-placed rhododendrons provide explosions of colour during their flower season. To the western boundary is a lightly wooded area where direct access may be gained to Windsor Great Park via a private pedestrian gate. An additional gate allows access to a nature reserve, defined by the Crown. To the front of the house there is ample parking for several cars and, in addition to a rustic 3-car carport, there is a double garage situated off the driveway. Discreetly positioned away from the house beyond the garaging is a row of timber machinery stores and a covered storage area.